Christians of the early Byzantine period built monasteries, churches and shrines in Galilee and on the shores of the Sea of Galilee to commemorate the ministry of Jesus and the miracles ascribed to him. Tabgha – an Arabic corruption of the Greek name Heptapegon (Seven Springs) – is the traditional site of the Miracle of the Multiplication of the Loaves and the Fishes. (Matt. 14: 13-21) It is situated in a narrow, fertile valley on the northern shore of the lake, watered by several springs. During the fifth century, a large monastery and a church decorated with exquisite mosaic floors was built on the site. The complex covered an area of 56 x 33 m. and included courtyards and many rooms used as workshops for a variety of crafts as well as for lodging for the monks and the many pilgrims who came to visit. The monastery and church at Tabgha were destroyed in the 7th century, probably during the Arab conquest of the country, and buried beneath a thick layer of silt and stones. In the 1980s, after excavation, the church was restored to its Byzantine form, incorporating portions of the original mosaics. The basilical church is divided by two rows of columns into a central hall and two aisles. In the eastern wall is a semi-circular apse and on either side of it, rooms for the officiating clergy. A raised platform in front of the apse is surrounded by a chancel screen and at its center an untrimmed stone was preserved under the altar. This is the traditional site of the miracle of the Loaves and the Fishes. 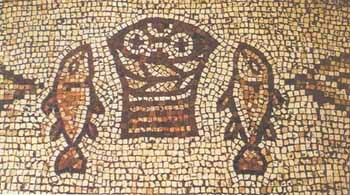 A mosaic depicting a basket of bread flanked by two fish was found behind the untrimmed stone. It was added in the 6th century, suggesting the stones significance; today it is displayed in front of the altar. The church is famous for its mosaics, unique among Byzantine churches in the Holy Land. Most of the floor of the church is decorated in ordinary geometric patterns. The unique principal mosaics decorate both sides of the transept. Particularly well preserved is the one on the left of the platform, a square carpet (6.5 x 5.5 m.) bordered with a band of lotus flowers. The carpets are decorated with multi-colored representations of the local flora and fauna, interspersed with several buildings. The flowers and animals, mainly birds, are so naturalistically depicted that it is possible to identify lotus, oleander and lily; also duck, snipe, heron, goose, dove, swan, cormorant, flamingo and stork. A tower marked with bands bearing Greek letters, probably for measuring the water level of the Sea of Galilee (known as a "nilometer"), is also depicted. The church belongs to the Order of the Benedictines and is open to visitors. Today, as in Byzantine times, large numbers of pilgrims come to visit. The main structure of the Tabgha, the Church of the Multiplication of the Loaves and Fishes, was severely damaged in an arson attack on June 18, 2015. The famous mosaic floors of the church were unharmed, although the surrounding structures including shops suffered significant damage. The attack was treated as a hate crime in Israel perpetuated by Jewish extremists after a Hebrew prayer verse forbidding the worship of idols was found spray-painted on the church walls.